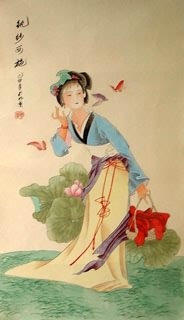 The Four Beauties (四大美人) in Chinese four women paintings are four ancient Chinese women in different dynasties. 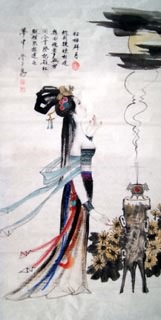 They are: Xi Shi(西施), Wang Zhaojun(王昭君), Diao Chan(貂蝉) and Yang Guifei(杨贵妃), they are renowned for their beauty, and their effect on the emperors and kings with whom they were involved. 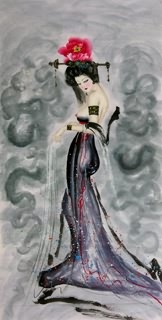 Some of them even brought kingdoms or dynasties to their knees. 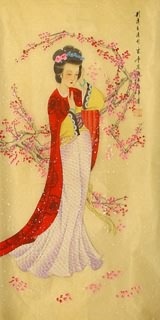 However, almost four of them ended their lives in mystery or tragedy. 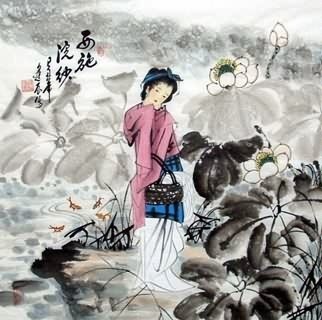 Xi Shi was a beauty in Spring and Autumn Period), and she was said to be "so beautiful that fish would forget how to swim and sink away from the surface when she walked". 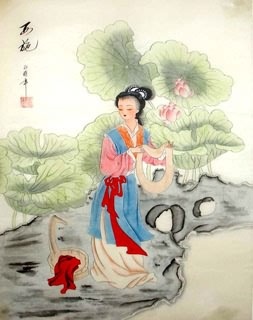 Wang Zhaojun, in Western Han Dynasty, was said to be "so beautiful as to make flying wild- geese fall from the sky". 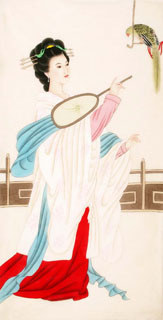 Diao Chan, in Three Kingdoms period, was said to have "a so lovely face that made the full moon hide behind the clouds". 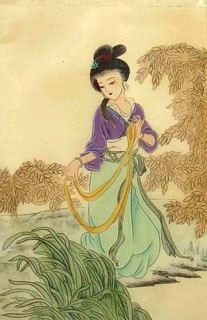 Yang Guifei, in Tang Dynasty, was said to have "a face that would put all flowers to shame". 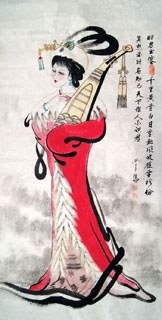 In order to make their stories more realistic, it's said that each of them had a flaw: Xi Shi had big feet(though they might be common size nowadays, and she suffered from chest pain; One of Wang Zhaojun's shoulder was lower than the other one; Diao Chan had a big ear and one small; And Yang Guifei suffered from an unpleasant body odor, so she often used lavish baths and scented powders. 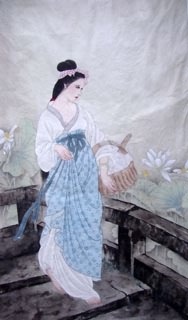 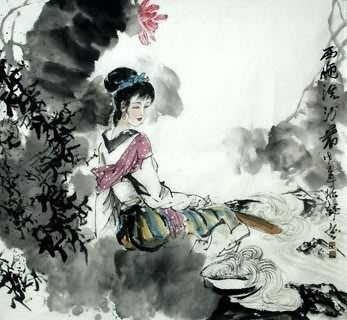 The most popular subjects of the Four Beauties for Chinese painting are: Xi Shi washing clothes, Zhaojun going abroad, Diao Chan worshiping the full moon and Guifei getting drunk.